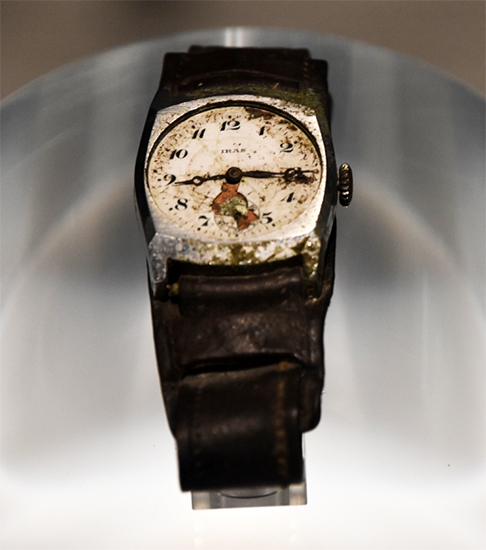 No words can really quite convey the experience of witnessing the city of Hiroshima first hand. Though Hiroshima is a proper noun and not a verb, it’s difficult to separate the two as Hiroshima is a place defined by its history. A visit to the Peace Memorial Park will offer you a sobering glimpse into the past as you explore the Atomic Dome site and the accompanying grounds. But it is when you visit the National Peace Memorial Hall and the Peace Memorial Museum that the true story of devastation, destruction and horror comes alive both literally and figuratively. 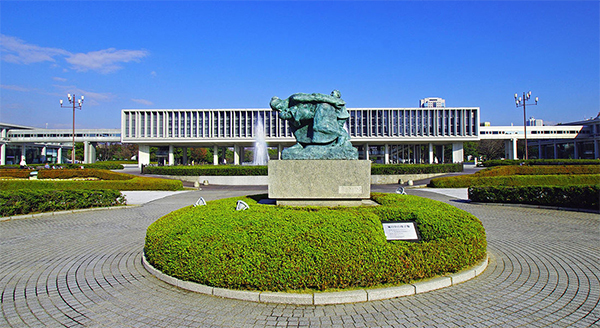 The National Peace Memorial Hall and the Peace Memorial Museum are two separate and distinct buildings that offer tandem experiences. In the National Peace Memorial Hall the names of each and every victim from the Atomic Bomb, both past and present, is both written and etched on a wall. The names here are meant to be felt, physically and emotionally. 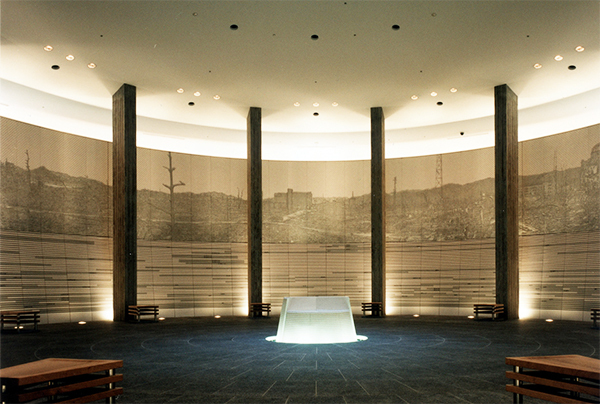 Visitors come to the National Peace Memorial Hall to understand that each name belongs to a person who was murdered, and lost a life that was meant to be lived. Computer screens are located throughout the National Peace Memorial Hall with options to either look up a specific name, or scroll through the thousands of names of those affected by the devastating effects of the atomic bomb. You can view their pictures, read their biographies and understand a part of who they were before their lives were interrupted. 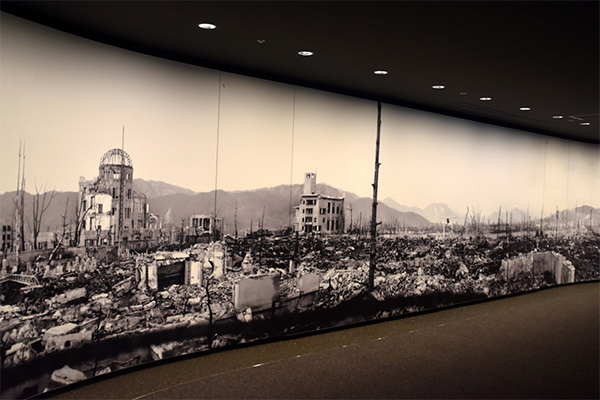 Whereas the National Peace Memorial Hall is about the specific individuals and who they were, and how the atomic bomb affected each person uniquely, the Peace Memorial Museum tells the story of what the atomic bomb did to the community, the land, and the city. It tells the story through artifacts, mementos and memoirs with compelling and vivid imagery. 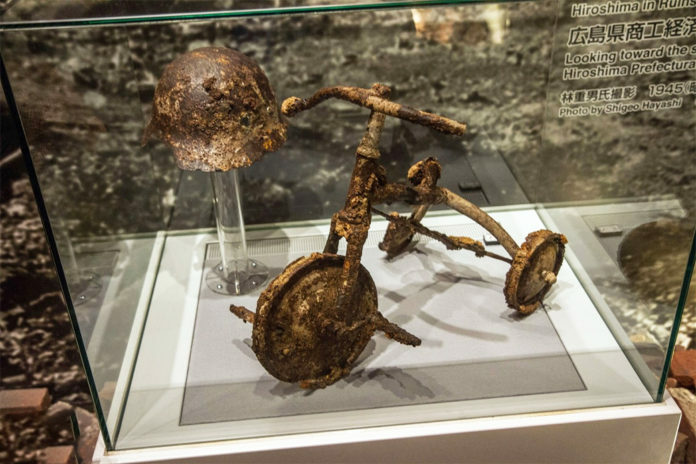 Here you’ll find items encased in the ravages of fallen buildings; a tricycle so rusted and burnt it appeared to be covered in warts; ashes burned onto the sides of buildings forming the silhouette of a dying girl who was burned alive. Upstairs depicts war ships, weapons and soldiers with accompanying timelines to tell the history of World War II in the form of models built to scale. A history that speaks of surrender side by side the story of brute force and carelessness. The culmination of the National Peace Memorial Hall is call to action to end all nuclear weapons. Over 200 countries have agreed to end their use of this horrific technology and abandon all nuclear weaponry. Thus the name for peace becomes more than just a thing. It is difficult to come here without feeling an immense range of emotions. It is sobering, terrible sad, solemn, exhausting, terrifying, egregious, confusing, painful, and heartbreaking. It is a place where you are acutely aware of how you came to be here, and where you came from. It is a place that will make you question what you know about the history of the world, and what you’ve been told about the realities of war. It may be one of the most important places you ever visit. 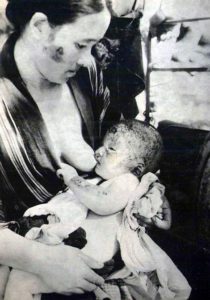 ► For Kids: With the many different sites located at the Peace Park in Hiroshima parents can cherry pick what they desire to expose their children to regarding this very dark time in history during World War II. There are unlimited opportunities for World Schooling at both the National Peace Memorial Hall and the Peace Memorial Museum with kids. Parents should be prepared for a lot of very difficult and very sobering questions for little ones. Perhaps this is the greatest blessing of all; having to explain to your children how power or misunderstanding or hate or revenge can cause (fill in the blank). This site offers a chance for deep reflection and introspection. 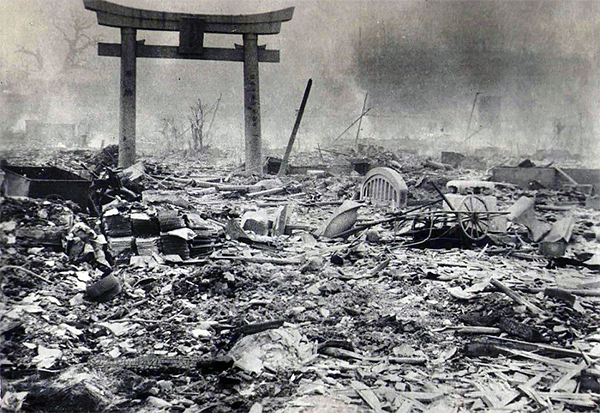 Have you visited the Atomic Bomb site in Hiroshima? We recommend planning a minimum of one full day here during your travels and arriving with as open a mind as is possible. 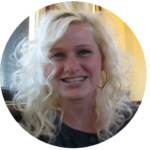 This is an incredible site to visit that will offer knowledge for all ages to absorb. ► Nap-Time Version: Visiting the National Peace Memorial Hall and the Peace Memorial Museum with kids in Hiroshima, Japan. During our time in Hiroshima we toured many other sites related to the Atomic Bomb including the A-dome and the Peace Park. Check out our experiences and what it was like to bring kids to this both great and terrible place in our history.